Brief history of the line. The line to Felixstowe had its beginnings on November 30th 1874, when a local landowner Colonel George Tomline of the Felixstowe Railway and Pier Company put forward plans to build a line from a terminus at Westerfield Station on the East Suffolk line to a terminus at Felixstowe Pier. The plans were approved and the line opened on 1st May 1877 with stations at Westerfield, Derby Road, Orwell, Felixstowe Beach and Felixstowe Pier. On 1st September 1879 the Great Eastern Railway took over operation of the line and on 5th July 1887 bought the line from what was now The Felixstowe Dock and Railway Company. On 1st May 1891 The G.E.R. opened a new station at Trimley and in November of the same year built a second platform and passing loop at Derby Road. The station originally only had the current down platform. The G.E.R then built a new station at Felixstowe, the now Felixstowe Town station which opened on July 1st 1898. 1951 July 2nd:- Felixstowe Pier closed. 1955 June:- Orwell Station closed. 1959 January:- Felixstowe sub shed closed, the last engine allocated being Class L1 67710. 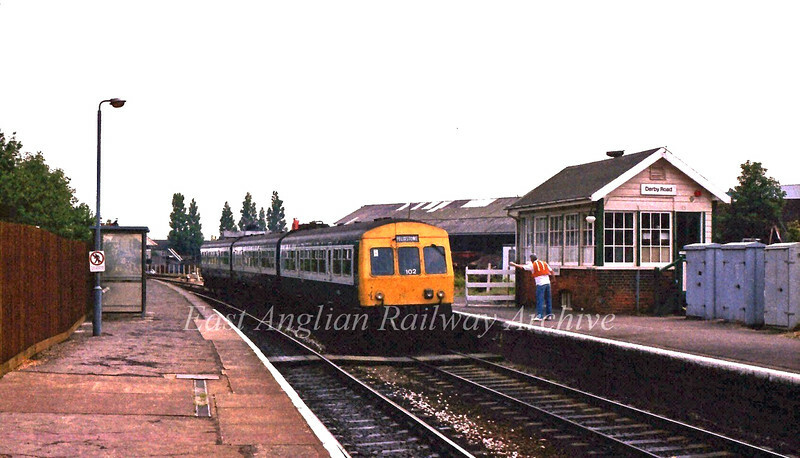 1964 July 13th:- Freight facilities withdrawn from Trimley and Westerfield. 1966 December 5th:- Freight facilities withdrawn from Felixstowe Town and Felixstowe Beach. 1967 September 11th:- Felixstowe Beach closed. Driver of a class 101 on a Felixstowe to Ipswich working drops off the single line token at Derby Road for the Trimley to Derby Road section. c1995 The aerial on the front of the dmu indicates that this unit was used on the East Suffolk Line utilising Radio Electonic Token Block, RETB, signalling. This poor quality image taken with a disposable camera.